HOUSE OF ROOIBOS Tea is tasty, refreshing and extraordinarily good for you! or colorants. It's Rich in Powerful Antioxidants that may help boost your immune system. Caffeine and Calorie free, which makes it good for the whole family, young or not-so-young! box has an easy-to-use flip-lid, and is a super container for storage. Relax, rejuvenate and revitalize with House of Rooibos, 100% Organic Herbal Tea. are committed to using House of Rooibos - their rooibos, our rooibos, your rooibos - as a force for good. 10% of profits go to educating children in the beautiful, Rooibos-growing region. harvested by hand at high altitudes in South Africa's exquisite Cederberg Mountains. On promotion for a limited time - Click Add to Cart to enjoy top-tier Rooibos Tea and great savings now! 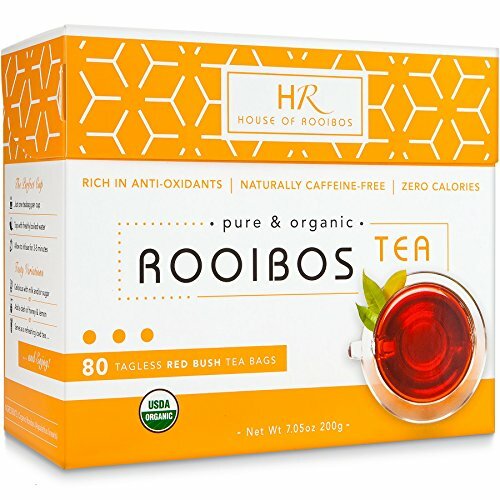 ✔ DELICIOUS FLAVOR - House of Rooibos tea is smooth, naturally sweet and delicious. It's a unique, nutrient-rich herbal tea that tastes great plain, or with milk & sugar, or as a refreshing iced tea, or as a hot latte. Our environmentally friendly box comes with 4 foil pouches containing 20 teabags each. This organic tea looks good, tastes good and makes you feel good. ✔ INCREDIBLY HEALTHY - Rich in Healthy Antioxidants and Naturally Caffeine Free, Rooibos is cherished for its MANY health benefits and feel-good properties. It's a natural immune-booster that provides a uniquely cleansing detox experience. It's entirely natural, deliciously healthy and good for the whole family. ✔ CAFFEINE & CALORIE FREE - This Naturally Caffeine Free tea helps to keep your mind and body calm and relaxed, easing stress and promoting restful sleep. It's an indulgence you can enjoy any time of the day or night! ✔ PURE & 100% ORGANIC - Our Rooibos grows in the beautiful Cederberg mountain region of South Africa, where pure mountain streams and pristine air are in perfect harmony, producing top-tier, truly organic tea. It has a Natural, vibrant red color and contains no additives or preservatives. It's as pure and fresh as can be... So good for you! ✔ HOLIDAY SEASON SALE - Buy now and get $4.00 off your 80 count box of Rooibos. HOUSE OF ROOIBOS tea makes a beautiful, healthy gift for all tea lovers, young and old. Enjoy! If you have any questions about this product by House of Rooibos, contact us by completing and submitting the form below. If you are looking for a specif part number, please include it with your message.